Shaparak Shajarizadeh has been arrested again for allegedly allowing her hair to show in public in Iran. Her lawyer, prominent human rights attorney Nasrin Sotoudeh, called the ongoing arrests of Iranian women for allegedly violating the country's compulsory hijab rule a "manifestation of violence against women." "I don't know if she removed her hijab or not but my question is, how come women get immediately arrested for not observing the hijab or having an inappropriate hijab, or wearing tight or short dresses, or wearing lipstick but in cases dealing with theft and murder, suspects never get arrested so fast?" Sotoudeh said. "Why should women be arrested like this every day?" she added. "This is a manifestation of violence against women." Sotoudeh informed the Center for Human Rights in Iran (CHRI) that the police detained Shajarizadeh along with her 9-year-old son on May 8 in the city of Kashan, 152 miles south of Tehran, for allegedly removing her hijab. Her son was released several hours later. All women in Iran are forced to cover the skin on their bodies (excluding the face) and their hair when they are in public. This rule was gradually imposed after the country's 1979 revolution by then-Supreme Leader Ayatollah Ruhollah Khomeini. Women who fail to cover themselves according to current standards in public in Iran could be arrested, fined, lashed and imprisoned for committing "haram." According to Article 638 of Iran's Islamic Penal Code: "Anyone in public places and roads who openly commits a harām [sinful] act, in addition to the punishment provided for the act, shall be sentenced to two months' imprisonment or up to 74 lashes; and if they commit an act that is not punishable but violates public prudency, they shall only be sentenced to 10 days to two months' imprisonment or up to 74 lashes." According to Article 639 of the Islamic Penal Code: "The following individuals shall be sentenced to one year to 10 years' imprisonment... A - Anyone who establishes or directs a place of immorality or prostitution. B - Anyone who facilitates or encourages people to commit immorality or prostitution." Shajarizadeh was previously arrested in late February 2018 for removing her headscarf and waving it on a stick in the north Tehran neighborhood of Gheytarieh. 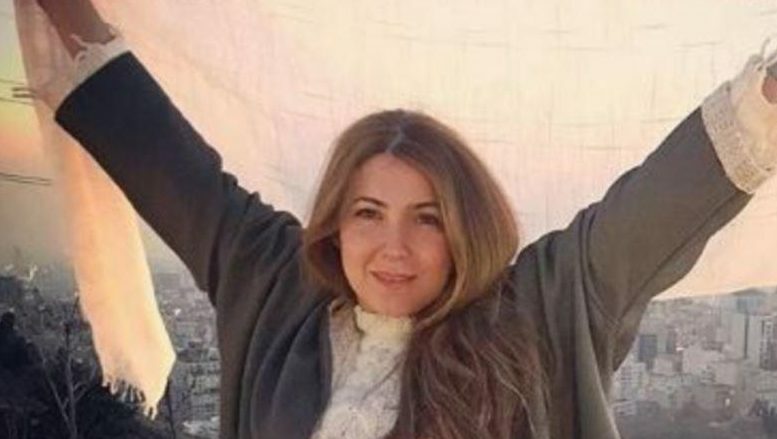 Shajarizadeh and several other women who have repeated the act in cities across the country in 2018 have since been referred to as the "Girls of Revolution Street" by social media users. Shajarizadeh is scheduled to appear at Branch 1089 of the Criminal Court in Tehran on June 10, 2018, to be tried for her previous arrest on the charges of "not observing Islamic hijab" and "encouraging corruption" her attorney told CHRI. Iranian women have been protesting against the compulsory that was instated in Iran shortly after the country's 1979 Islamic Revolution for more than three decades in various ways, including by allowing more and more hair to show under their scarves as the years passed on. But the protests received international attention in 2018 after 31-year-old mother Vida Movahed stood on a sidewalk utility box on Enghelab (Revolution) St. in Tehran on December 27, 2017, and waved her headscarf like a flag as the first known woman to have done so in Iran. Two women are currently facing prison time for engaging in the peaceful form of protest. On March 7, sociology student Narges Hosseini, 32, was sentenced to 24 months in prison-21 months suspended for five years-for the charges of "encouraging people to engage in corruption by removing the hijab in public" and "committing a forbidden act in a public space." On March 25, Maryam Shariatmadari, a 32-year-old computer science student in Tehran, was sentenced to one year in prison for "encouraging corruption by removing her hijab." It is unclear whether either of the women will be forced to serve the sentences.